The morning of 25 September 1598 the armies clashed in a major engagement at the Battle of Stångebro. Charles offered talks again but attacked in a mist while Sigismund's men were withdrawing to their camp, which resulted in only the mercenaries fighting since his Swedes refused to fight. Duke Charles won a decisive victory that forced Sigismund to agree to harsh terms. Charles demanded that the King send home his entire army but that he himself was to stay and await a Parliament. Also, a number of Swedes who had sided with Sigismund, including his Council supporters, were captured. These were later executed in the Linköping Bloodbath of 1600. 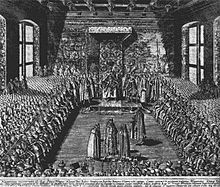 The peace agreement was sealed with a dinner between Charles and Sigismund at Linköping Castle. 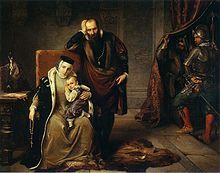 The King, who was under pressure, fearing for his life without his army and having realised that he had lost the political battle, fled during the coming days to Poland in late 1598. At the same time as the peace treaty was being signed in Linköping, conflicts were taking place in Dalarna. There, a pro-Sigismund bailiff, Jacob Näf, had tried to raise up the Dalecarlians against Duke Charles. Chaos ensued, Näf was executed, and the Dalecarlians set out on the so-called Neaf Campaign (1598), burning and killing down to Brunnbäck ferry. In Västergötland, Carl Carlsson Gyllenhielm, illegitimate son of Duke Charles, defeated the rebellion. ^ Read, John (1995-01-01). From Alchemy to Chemistry. Courier Corporation. ISBN 9780486286907.